It was love at first sight…of his profile. The minute I saw him online I knew he was different. 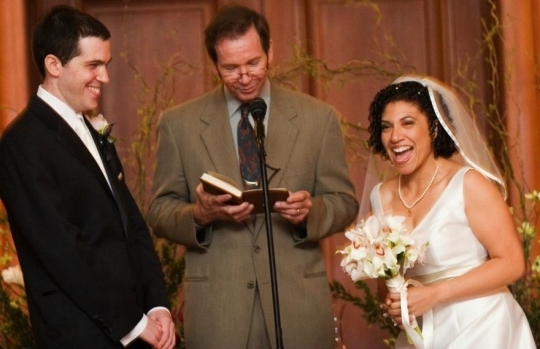 I still remember waiting for him to walk in the door on the first date, wondering which tall, dark and handsome man matched the picture I had seen. You see, I’d become accustomed to the “bad boy.” The kind of wayward artist/actor/writer who wouldn’t be caught dead in a chain clothing store. The kind of bad boy who would tell me everything I wanted to hear then mysteriously stop returning my calls. I never was the girl in school who was chased by boys. I never had a date on Valentine’s Day. I always struggled to feel beautiful and to fit in. My low self-esteem allowed me to be with men who didn’t treat me with respect and who didn’t value the things that made me special. All of those qualities I wanted to hide from other guys were able to shine through when I met my Mr. Right. Actually, many of them were the qualities that attracted him to me. This my love story. Now I want to help you write yours. I put my heart and soul into these programs so that you can start rewriting your love story immediately! When you start by taking the quiz, I will use that information to guide you stage-by-stage through your new and improved love story that has the ending you’ve always wanted and completely deserve. If waiting any longer is just not an option, take a look at each of my programs and get started at your own pace. I can’t wait to go on this journey with you! Dating apps have become one of the primary steps in the dating process today. If you are struggling to get matches and secure dates, you may benefit from our Profile Starter Kit. 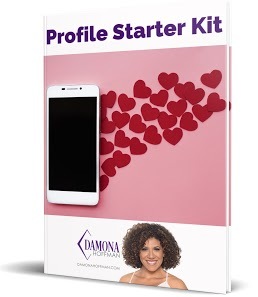 This kit and accompanying video will give you the tools you need to flesh out your profile, with writing prompts and plug-and-play profile templates where all you need to do is fill-in the blanks. You will also receive a short video where I will tell you exactly how to select the BEST dating profile pictures! Do you struggle with first dates? Are you stuck wondering where to find dates at all? 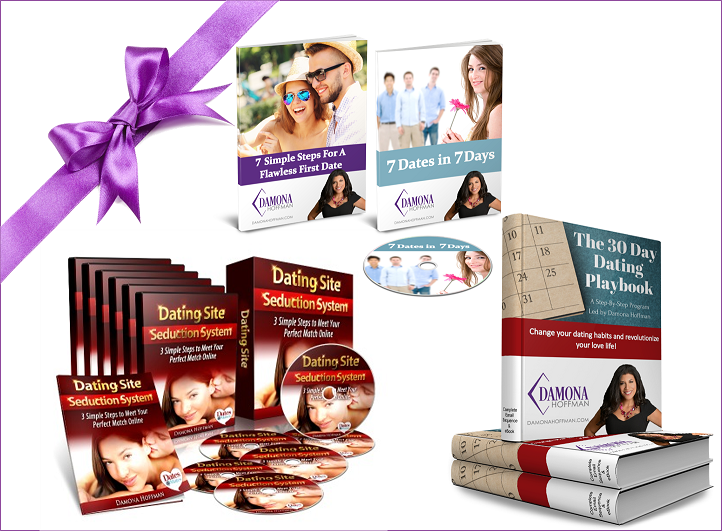 The First Date Starter Kit will get you on track to great first dates fast. Learn out how to tap into your very best dating resources to find the most exciting, first dates and prepare yourself for that amazing, first encounter. If you are truly ready to change your love life for the better, this First Date Starter Kit is a must have! In this highly acclaimed system, I reveal the 3 simple, easy, and super-effective steps you can use to effortlessly attract your perfect match online. These are the same steps I used to meet my husband online, and they can be used by you to stand out from the competition and attract your ideal mate. I’ll show you how to turn your profile into your “Man Magnet” to attract all the RIGHT men while shooing off all the WRONG men. It’s time to stop wasting time on losers and men that don’t turn you on so you have more time to find your soul mate. After getting your ideal match interested, your next step is to get him to beg you to go on a date… a second date… a third date… a fourth date… and maybe even move on to next level! I’ll show you exactly how to do that, and more! This stage is for anyone who is ready to revolutionize the way that they date. I’ve put together a comprehensive program that is based on the belief that it takes 30 days to begin a new habit. Over the years I’m certain you have learned so many things about dating that are WRONG! Well, this guide is all about helping you “un-learn” them. This program is so special that up until now, I only sold this program privately. But now, I’m opening it up to everyone who is serious about turning their dating life around. I’ve seen these principles help so many daters and I want you to be one of those select individuals who have direct access to my premium tips. I’ll admit that this program is only for those who are truly serious about changing their dating ways. So, if you’re ready, I’m laying it out… play-by-play… clear as day. The Diamond Bundle is for the dater who is ready to go all out! You know without a doubt that you are in it to win it, and you’re ready to win NOW! In this bundle, you will receive immediate access to all of my online programs immediately. As you know, I’m all about celebrating the authentic YOU. So, my programs will never attempt to change you. They will only show you how to give what’s on the inside the opportunity to shine on the outside. Get ready to go from first date to forever by taking control of your destiny and rewriting your very own authentic love story. Got Something Else In Mind? Damona has profoundly impacted my life as a mentor for acting, a go-to girl for advice in dating relationships and an explorer in new ventures. The advice given to me was invaluable. I learned how important it is to bring who YOU are into the room when you meet someone for the first time. Whatever it is that makes you special will always shine through if you are being truthful and open. For all of you out there, I hope you all have a GO-TO girl like I have. It makes the yellow brick road a lot easier. I was lost in a forest…all alone. After roaming aimlessly for years, I was pretty disappointed in my online dating results. I thought if I just put my profile out there I should get results. But the results were not there. Damona explained what I was doing wrong. With new photos, an update to my profile and a renewed spirit to be more proactive, I was able to get back out there and find what I was looking for. 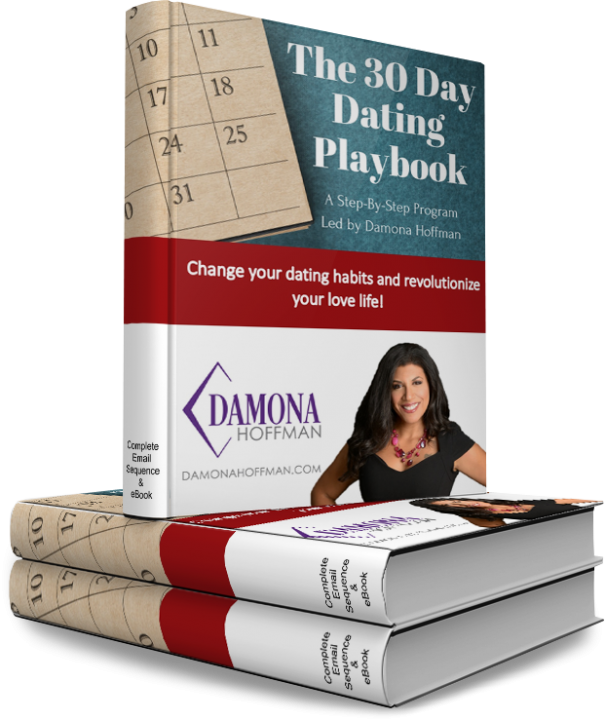 I had been on various online dating sites for years and was about to give up on them when I started getting guidance from Damona. Her book is illuminating. Her advice is clear and concise. Her positive attitude is infectious. I went back online with an updated profile and a new approach, and this past July I’m happy to say I married the love of my life. Damona encouraged me to try something new and different. I did not see myself as someone who wanted to invest time and money in online dating, that is, until I was given the support and encouragement to make it worthwhile. Since the time I began online dating I have not looked back and I have only to thank Dear Mrs D for my success. Damona has really transformed my attitude and outlook on dating in LA, which can be overwhelming and frustrating to say the least. She has great exercises that not only helped me to define what I am looking for in a man but also what I feel I have to offer my partner. Her tips on dating, which cover everything from date ideas, to personal safety when meeting someone new, to conversation starters, to crafting the perfect online dating profile, were tremendously helpful. I also really enjoyed that she tasks her clients to foreshadow where they envision themselves 3, 6 and 12 months down the road. I am now happily dating someone and have Damona to thank in large part for keeping me open-minded, instilling confidence in me, and reminding me never to settle. I am currently having my “I Heart Damona” shirt printed up right now so that I can where it everywhere and spread the word. Now, I’m not saying I’m the queen of great decisions – I currently own a white couch and I’ve dated some extremely questionable dudes – but working with Damona has been, hands down, one of the best decisions I’ve ever made. When we first met, I was heartbroken and not even sure how to re-enter the dating world. She held my hand and we dove in together… and for that I am very grateful. And the best part? She knows everything. Forget about the fact that she’s crazy smart and cares deeply about her clients, this lady KNOWS HER STUFF. She knew how to approach posting a dating profile (and literally everything about online dating), she knows how to deal with the first date and she seems to know what both men and women are thinking post-date. How does she know all this stuff? Don’t ask me – ask her – she’s got a gift. If you’re as lost and clueless and bummed out about dating as I was, don’t hesitate to connect with the expert. And the best part? I’m now in an exclusive relationship with a great guy and I know how to communicate my thoughts and needs. It’s a whole new world… and I have Damona to thank. As a first timer to the online dating scene, Dear Mrs D truly took what seemed completely foreign and a bit frightening and made it into something very manageable and actually fun. I hadn’t been on a date in a very long while and I had been very resistant to trying the online dating thing. 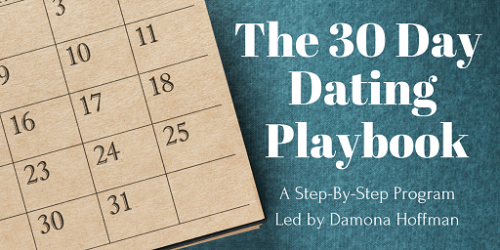 But with Damona’s guidance and easy-going, very practical advice, I jumped in and went on more dates than probably my entire dating life! Just to get back out there was amazingly empowering, and the entire process became not just about finding a mate, but learning more deeply about myself.